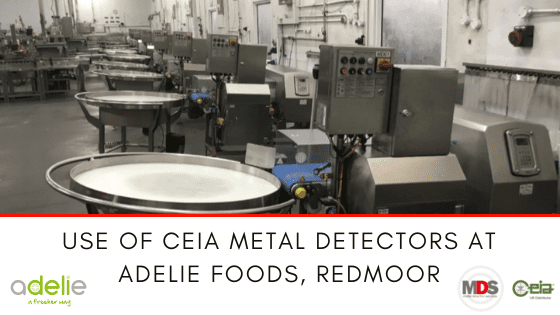 Adelie Foods commissioned 11 CEIA THS/MS21 multi-spectrum metal detectors at their Redmoor site in 2016 in order to provide improved metal detection capability within their manufacturing process for sandwiches, wraps and similar products. The units were built to CEIA standard design to meet Adelie Foods’ criteria for metal detection and were installed by Metal Detection Services (MDS) Limited. The specification for the metal detector units was agreed to enable the site to meet enhanced Code of Practice requirements for major retail customers. The higher sensitivity of the units, their comprehensive fail safe mechanisms and potential for capture of real time data are amongst the key attributes that are being realised by the site. The simplicity of the units fitted into the factory footprint seamlessly and, from initial dialogue to complete installation, support was provided at all stages by MDS or directly from CEIA. The units have demonstrated reliability with no equipment failures. The equipment has been found to be easy to operate and maintain by the Adelie Foods Redmoor site team.